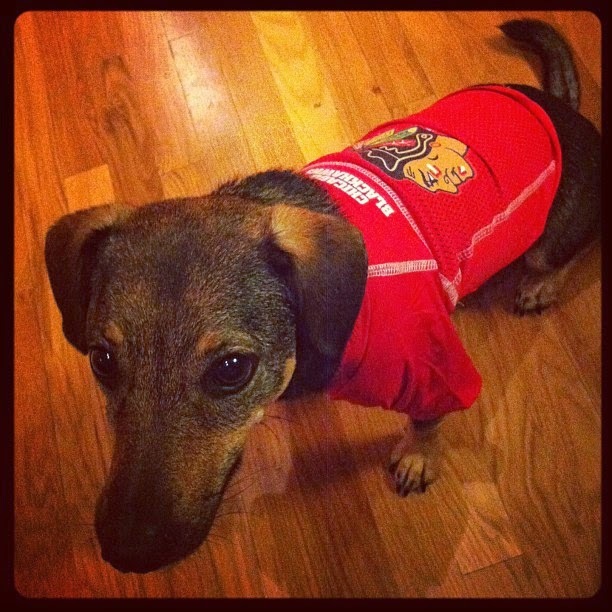 Lately, hockey has been the focus of my attention and blogging has taken a backseat. 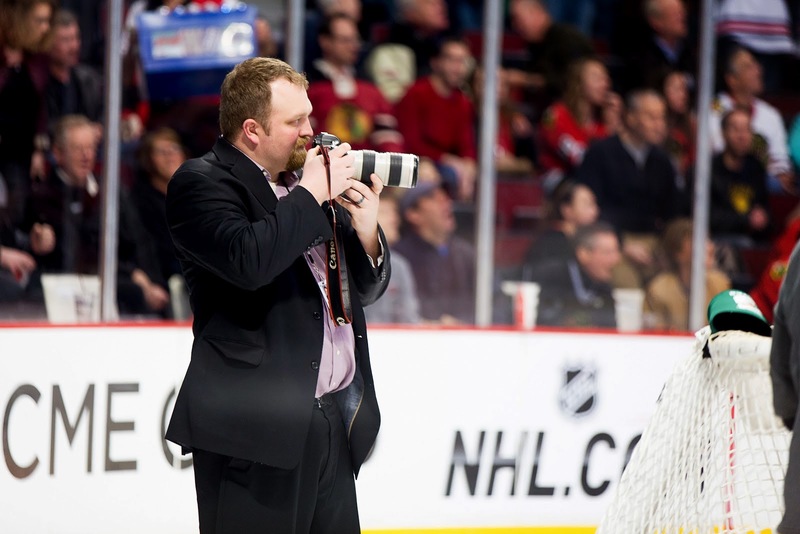 Our daughter, Kirsten, is married to Chase Agnello-Dean, who is the Director of Photography for the Chicago Blackhawks. Chase has had an incredibly busy Spring. Last night, the Chicago Blackhawks became the 2013 Stanley Cup Winner. Chase was on hand to capture the moment in Boston. Congratulations! It was a great series. Official photographers are required by the NHL to wear protective head gear when shooting near the ice and Chase complied. Chase has gotten a lot of attention for this. 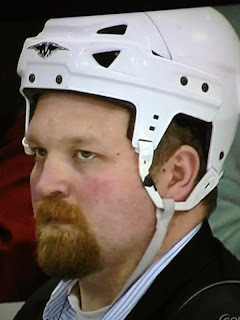 A Chicago news station ran a short video clip of Chase at one of the Stanley Cup games with his head gear on. People who know him have kidded him about it. He might have looked more excited if the head gear had fit. 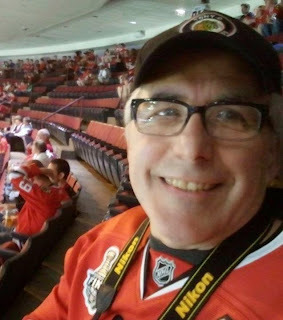 Kirk and I had the privilege attending Game 5 of the Stanley Cup Finals when Chicago played the Boston Bruins in Chicago. It was a great experience. 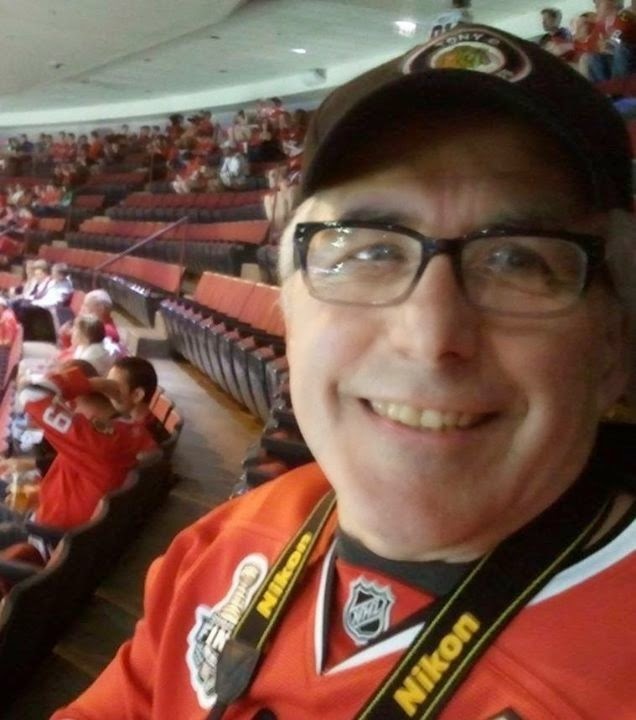 The atmosphere at the United Center, where the Blackhawks play, is like no other. The fans stand and cheer loudly throughout the national anthem and it doesn't let up from there. Chelsea Dagger song is played whenever the Blackhawks score and win. It pumps the crowd up, including me. Rally flags are waving throughout the crowd. It is incredible. I even high-fived a few people after the Game 5 win. Even Ella, Kirsten and Chase's dog, roots for the Blackhawks in her jersey. She does miss Chase when he travels with the team. Ella will sit on their rug by the door and wait for Chase to come home when he has been gone for too long. Kirk and I were watching Game 6 at home. It looked like the Bruins were dominating and would force a game 7 back in Chicago. There was 76 seconds left and the Blackhawks score to tie the game. Okay, we will be going to overtime. 17 seconds later, Blackhawks score again! They take the lead. Are they going to win this on the road? Kirk and I are ecstatic. I am saying, yes, yes, yes. I play Chelsea Dagger on Itunes. I can hardly breathe. The seconds tick down and the Blackhawks win. What a game! Unbelievable! Kirsten and I start texting back and forth. We see Chase on TV. He is in the locker room getting drenched with champagne as he takes pictures. Kirsten comments about his suit needing to be cleaned. His camera's are getting drenched as well. Overall, it was a fantastic experience. Chase is going to have a busy summer as he follows the cup around Chicago and photographs it. Kirsten will be a hockey widow and Ella will be sitting at the door later at night. It is a great experience and I am proud of Chase and how hard he works. I just hope he takes a moment and enjoys the time. He will be a part of Chicago Blackhawks history forever. Congratulations! 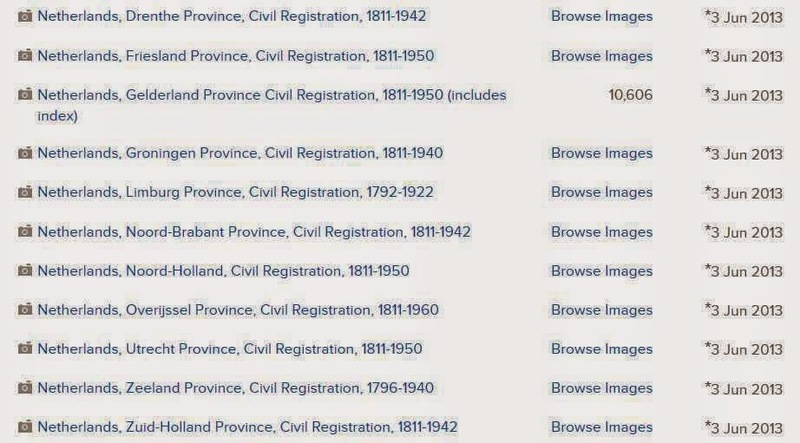 The list below contains the new and updated records found at familysearch.org. 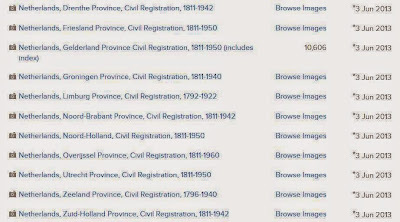 Look under Netherlands to be taken to the record you are seeking. I am off to check them out. I hope you will too. Kirk's great uncle, Glen Dollaway, was born 6 July 1907 in Lowell, Kent, Michigan. He is the son of Willis G. Dollaway and Francis A. Dollaway nee Denny. Glen died on 26 March 1978 in Grand Rapids, Kent, Michigan. Gertrude Dollaway nee Koning was born 10 January 1906 in Grand Rapids, Kent, Michigan to Nicholas Koning and Ella. Gertrude died on 12 September 1998. Glen Dollaway and Gertrude Koning were married on 8 July 1928 in Michigan City, Indiana. They were the parents of two sons, James and Duane. Glen and Gertrude Dollaway are buried in Oakwood Cemetery, Lowell, Michigan.